LAKE LOS ANGELES – A man was stabbed in Lake Los Angeles Tuesday night and later died at the hospital, authorities said. The stabbing happened around 9:30 p.m. Tuesday, April 9, on the 41700 block of 156th Street East, according to a news release from the Sheriff’s Information Bureau. “Deputies from Lancaster Sheriff’s Station responded… regarding a call of an assault with a deadly weapon that had just occurred. Upon arriving, deputies found a male white adult suffering from apparent stab wounds. He was transported to a local hospital where he was pronounced dead,” the news release states. “Investigators are detaining one person as the investigation continues,” the news release states. A news photographer at the scene reported that a woman was arrested at the scene and a knife was recovered. The names of the victim and woman reportedly taken into custody were not immediately released. The circumstances that led up to the stabbing were not disclosed. 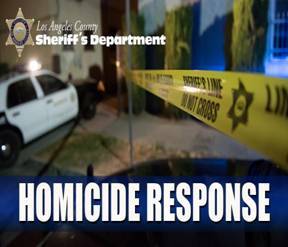 Anyone with information about the stabbing is encouraged to contact the sheriff’s Homicide Bureau at 323-890-5500 or Crime Stoppers at (800) 222- 8477. 5 comments for "Man stabbed in Lake Los Angeles, later dies at hospital [update: victim ID’d]"
R.I.P. Eddie. We’ll miss you. Our third murder for 2019 in Lake La. It must be something new in our water.